Akash Kusum (Mrinal Sen, 1965), a Bengali film I truly love, and Manzil (Basu Chatterjee, 1979), its also excellent Hindi remake, are very similar to look at—and I have included a lot of photos to show just how similar the scenes are. But the titles make clear the contrast in their tone. Bengali friends have told me that the original title translates to "flower bud of the sky," meaning "daydreaming," "improbably imaginations," or "building castles in the air" (mrinalsen.org calls it Up in the Clouds in English), whereas the Hindi version sounds much more resolute: "destination." Even if the sense of "manzil" is more like "stage," a stage is a measurable, sometimes very long-lasting or real place, whereas a flower or castle in the sky is imaginary, impossible, and inherently unsupportable. There is a desperation in Akash Kusum that in Manzil seems more of an attainable wish or even an eventuality. is mirrored by a growing romance with a girl from a higher-class family (Aparna Sen as Monica in Akash Kusum and an equally wooden Moushumi Chatterjee as Aruna in Manzil). and the romance by the compounding lies the hero has had to tell to keep up the facade that initially let him be in the same orbit as the heroine. Both also have great moments of humor as Ajoy/Ajay has to cover his lies on the spot. My favorite is over the phone, as he pretends to search a nonexistent appointment book when Monica/Aruna suggests a movie date. (I'm reminded of Bridget Jones's self-affirmation that she is "v busy and important" when she wants to ignore Daniel Cleaver.) The most famous, however, is a giant bluff at a sari store when he grandly offers to purchase her selection and then has a long, completely fake conversation with his empty office about where he left his wallet. I'd love sari-knowledgable people to comment on the wares in the shops. The Bengali is marked as handloom, and the 15-years-later Bombay shop looks full of polyester? [SPOILER] The two films end differently—Manzil carries the story further and concludes it somewhere very different in plot and feeling than Akash Kusum—and to me it seems these choices in storytelling speak clearly about what the original audiences valued and expected. I don't want to carry too much into these films from stereotypes about the respective industries, but it does seem the Bengali hero is more self-doubting. His arc is less smooth and steady than the Hindi hero's arc. Basu Chatterjee may count more as middle cinema than masala, but the final shot in Manzil could be straight out of any Hindi mainstream film; Mrinal Sen's is more ambiguous and shows very different emotions on the characters' faces. There's an interesting visual detail in each film that suggests their approaches to themes like uneasiness and facade. In Akash Kusum, Sen peppers stills of characters and Calcutta throughout the film (an artistic choice critiqued by Satyajit Ray—read more here and here), rupturing the narrative yet also augmenting the mood and information by spending time on very particular views. This emphasis on moments is maybe reflective of how we remember our days: scattered little bits rather than fluid sequences. 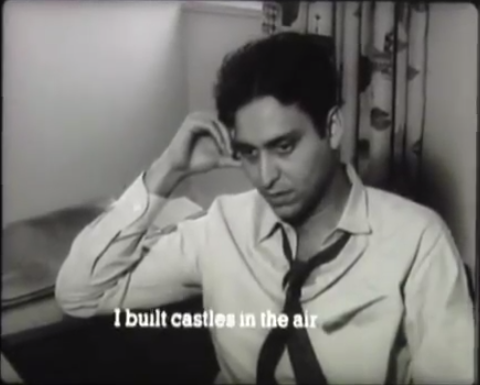 In Manzil, Chatterjee instead accompanies the titles with stills taken from elsewhere in the film but rendered in psychedelic or inverse colors, perhaps suggesting mis- or incomplete perception. What I get from these similar but distinct visuals is that Akash Kusum is saying something about discrete decisions—moments in which choices are made and set into motion a certain chain of events— and Manzil about false impressions. Does either suggest resolution at all, let alone an easy or comfortable one? And what better choices could there be for lead actors to portray the overall vibe of each film? Soumitra Chatterjee is a master at depicting thoughtfulness, brooding, and any kind of brain-backed emotion (worry, hope), and Amitabh Bachchan conveys with words and physicality that he can make things happen. Both give wonderful performances in different directions. The Bengali lead character seems a little more nervous, a little more aware that his castles may come crashing down at any minute. He has moments of confidence as he acts out his dreams, but when he stops to reflect—or is made to realize his risks when reality rudely intrudes—he looks subdued or broken. Ajoy pouts more, too, in facial expression and tone of voice, if not actual words (I didn't have subtitles for Manzil so cannot state with certainty). He is more childish, whining to his mother and being temperamental with the friend whose resources and emotional support have made his ruse possible (Subhendu Chatterjee). Manzil's Ajay is more buoyed, less wobbling in his striving for success in business and society (as represented primarily by acceptance by his girlfriend's family). His relationship with his friend (Rakesh Pandey) seems more jovial and less volatile, though Ajay does get in a snit from time to time. I am fascinated by how directly the Hindi film creates moments from the Bengali. Because Manzil is so often a scene-for-scene remake, there are many opportunities to look at how the actors and directors handle the same concerns. The pair of images below is from one of my favorite scenes: while out on the city streets with his slimy business partner, Ajoy/Ajay suddenly sees his love interest driving by. Both are horrified at the idea of being spotted either in that place or with that person and fake a coughing fit as a reason to hide their face (Ajoy also ducks behind a mailbox). While combing through my screencaps of Akash Kusum, I noticed how many images show characters on the telephone, and that got me thinking about how much this now utterly mundane and ubiquitous tool means to the characters and the story of these films. It's not just a symbol of prosperity: it makes the mobility and self-presentation in these stories possible. It works over distance and thus is very helpful when you need to lie, yet the phone also connects Ajoy/Ajay to the business and social worlds and opportunities he so deeply desires. He is unlikely to run into those types of business or romantic contacts in his everyday life, and phone calls in these films are often (though not always) deliberate, even arranged. "Pick up the receiver: I'll make you a believer" keeps echoing through my head. If I understand correctly, it is when Monica/Aruna asks for Ajoy/Ajay's phone number that his lies begin. We see the panic flicker across both actors' eyes—the films have shown us where he lives, and he and his mother definitely do not have a phone. Interestingly, even when they're not on the phone, characters are often near one. It lurks, equally threatening and enticingly, a fixture in many different emotional states. You never know who's on the other end. These films also capture that wonderful dopey feeling you get when the person you lurve calls you, the phone transporting you out of a consciousness of where you actually are and into the dreamy world where just you two exist. Coincidentally (I swear! ), Trisha Gupta just wrote a piece on the phone in Hindi cinema. It's a great read, discussing aspects of phone-based life like disruption, long-distance romances, and pocket-dialing, as well as the deliberate choice in The Lunchbox not to use modern phone technology in the principal story. Like Calcutta 71, maybe after a certain point there isn't much to say about Akash Kusum/Manzil that isn't narrating the films directly. They are gentle and engaging, combining hopefulness, determination, and defeat to disparate effects. Each one works very well on its own, even almost 15 years apart and in different film cultures. In thinking about them together, maybe the most interesting point is that they are both so successful in their own storytelling built off of the same basic foundation. PS I can already hear some of you saying "BUT WHAT ABOUT THE SONGS?!?!?!?" This is the one area in which Manzil suffers a bit from me having already seen Akash Kusum so many times. "Rim Jhim Gire Sawan" is nice on its own, and I do appreciate how it makes the couple seem so cozy and comfortable together, as well as the sort of ethnography of 1979 Bombay in the background, but in the flow of the whole film I find it just a little...soggy. Despite full awareness of how the films are handling the story, I cannot let go of the music that opens Akash Kusum (hear it here): light and ascending on unusual instrumentation (sounds like Rushmore, doesn't it?). 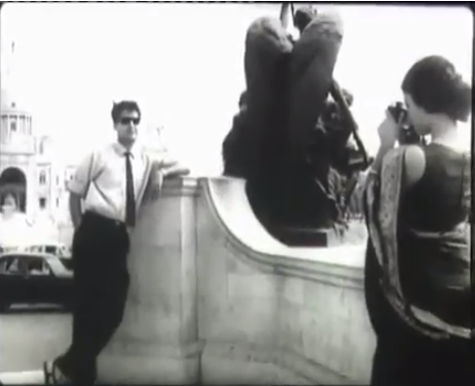 The corresponding "couple wanders around the city" sequence in Akash Kusum, which is another series of Sen's famous stills, opens with Ajoy's single unaccompanied voice, answered by Monica's (listen/watch here), then a minute or so of shimmering instruments, then ends with the sounds of the port and road with no human voice. To me, all of that is perfectly done, both as an isolated sequence and within the film as a whole. I want something similarly nuanced in Manzil; "Rim Jhim" is a little bit too much, even knowing that it's part of a different style of narrative. The two films handle their music differently, and on this particular point I have a preference. PPS This will be the cover of my (currently imaginary) book on 1960s and 70s Bengali cinema. * Uttam Kumar films turn up in Hindi more often, it seems, played by Dharmendra and Rajesh Khanna? ** I am not clear on why the lead character does not pursue music as a career when he seems to be good at it. Is he not as good as I think, or is there language about having tried and failed at music professionally, or does he just have dreams that are more expensive than the income he thinks music can provide?